From the moment we arrived at the Oppenheimer’s private Fireblade Aviation Hanger in JHB; I could feel we were in for a special experience. The Tswalu team clearly has a ‘no hassle travel’ ethos. You don’t have to do anything really, other than relax. It’s a breath of fresh air to have such an uncomplicated travel experience. The facilities at the hanger are great and Nettie and her team will look after your every need… often before you even realise you ‘need’ it. In just under 2 hours, on a private plane, we had arrived in a truly magical place. Nicky, our guide for our stay was there to meet us on the runway with a warm a welcoming energy about her. We jumped onto our open vehicle and headed to the lodge. From the outset I was mesmerised by the beautiful landscape surrounding us, the rolling hills and rich red sand under my feet. It’s important to understand a few things about this magical http://www.cialispharmaciefr24.com/cialis-en-mty/ place. It was not always as it is today, and is an on going passion project, with conservation as it’s first priority for the Oppenheimer family. Nicky Oppenheimer’s mission from the start has been very clear, “To restore the Kalahari to itself”. “Tswalu” means “new beginning” in Tswana; and the feeling of ‘good’ in every aspect of this enchanting place is inescapable. There can be no doubt that the team at Tswalu is an exceptionally dedicated one. Evidenced through the fact that many of its staff have worked there for more than 10years and counting. There can be no doubt about the difference it makes to the experience of both the lodge and wildlife when you have a well connected team running things. The attention to detail is hard to describe; they seem to just get it. On our 1st night temperatures dropped low as a cold front gripped the country for two days. Having a log fire burning in my room next to our cozy King Sized bed after we returned from a gourmet meal created an unforgettable atmosphere, which swiftly dealt with the cold. The days are warm and full of adventure and surprise while the nights are spent around a fireplace with an excellent glass of wine and interesting company. Winter in the Kalahari? At Tswalu, now that I can do! Now for the good stuff, nature at it’s best. From our first moments on game drive we began to understand the wonder and excitement, which surrounds this enchanting place. 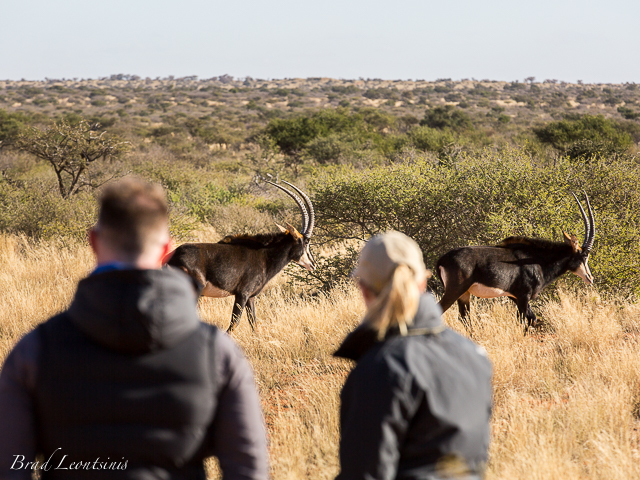 We were immediately, treated to sightings of Roan, Sable, Oryx (Gemsbok) and Tsessebe. Animals which you are extremely fortunate to see in any other regions while on safari. It was especially unique to be able to get out of the vehicle and walk a small herd of Sable. Being able to jump off the vehicle at any time and walk with just about any of the non-threatening species is one of the really awesome things about this exclusive experience. 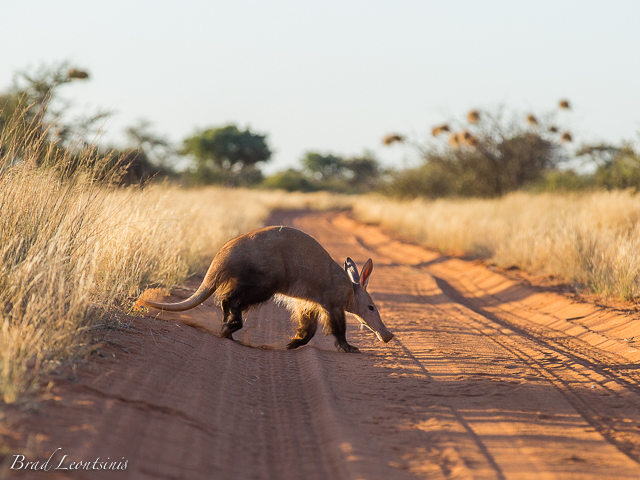 The Aardvark is another of Tswalus’ rare treasures, and we where fortunate to have 3 great sightings. It was awesome to see Brad so excited at our 1st one; he was like a kid! We jumped off the vehicle and slowly followed…. Then it started to cross the road right in front of us! We where all crouched on our knees just a few meters from this once in a lifetime sighting! A moment we will never forget! The cheetah viewing on open savannah planes is remarkable. We had a great opportunity to see the evidence of a territorial battle between two coalitions of male cheetah. This must have been quite a fight because the two we saw were very obviously the victors but had the wounds to prove it! 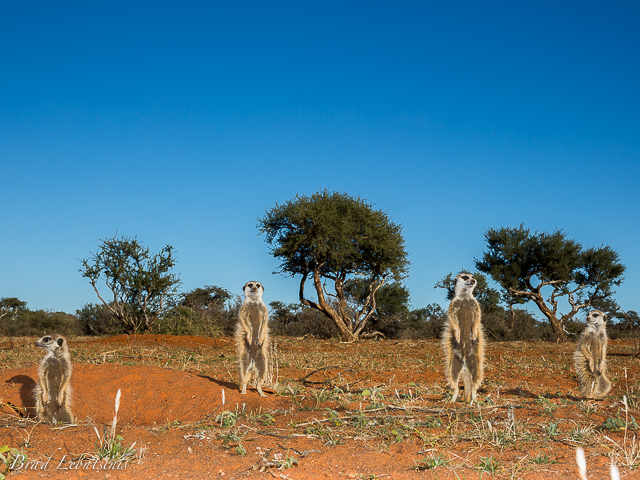 On our last morning we got to spend time with one of the meerkat colonies. This was my highlight! By spending time, I mean sit amongst them as they warm themselves in the morning sun and go about their routines, just an arms length away. To be that close to these inquisitive little creatures is so much fun; every time I think about it I smile. A fantastic experience! 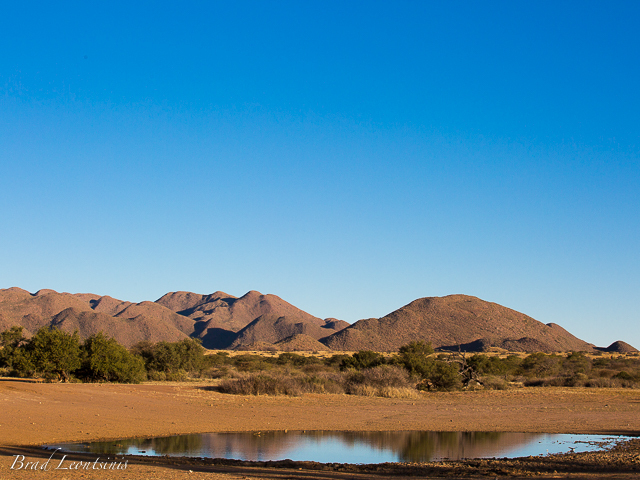 The reserve is also home to the desert black rhino; Tswalu represents one third of SA’s remaining population. As well as, impressive black-manned Kalahari lions, and so much more. 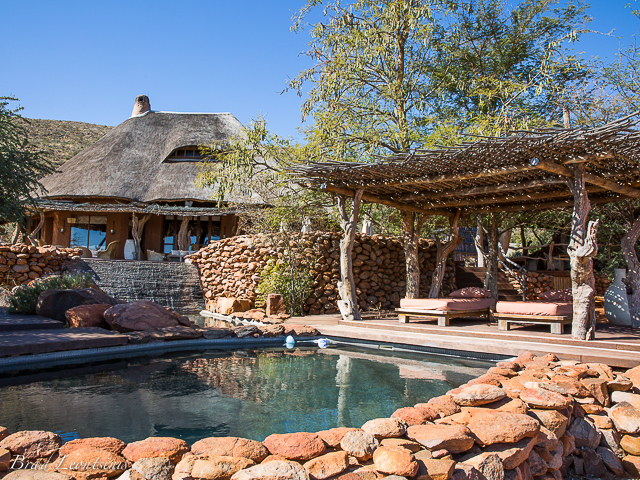 At maximum capacity Tswalu will take only 30 guests – emphasis is on privacy and exclusivity. Covering an area of over 100,000 hectares (1000 sq km or about a quarter of a million acres), make it SA’s largest private game reserve. The human and wildlife relationship here is evidently symbiotic, which in today’s times is a rare experience that only a select few will ever truly appreciate and understand. It is a natural wonderland, where the true naturalists will get lost in its playground; this experience is intimate and immersed. Your very own Kalahari paradise; where time is your own. 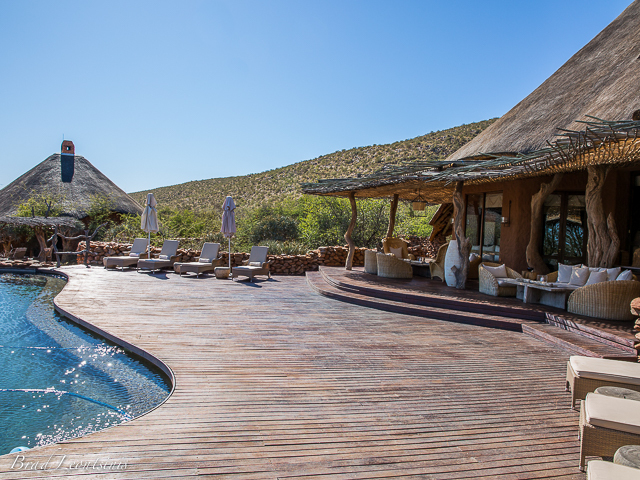 Flexibility is a specialty at this lodge; which is an essential part of any great lodge, but at Tswalu they really mean it and I have to say it was a real breath of fresh air. Each day is planned with your guide to match your specific desires and hopes for the days adventure! Tswalu is a uniquely flexible luxury safari experience that will leave you planning your return; definitely one to have on your list!